Experts keep sharing the common prediction that global retail from eCommerce sales will double during the next five years and will reach almost 5 billion U.S. dollars in 2021. Clearly, digital commerce is on a roll and the profits are increasing faster than light. You have all the reasons to celebrate this success yet we would advise you to fasten your seat belt and stay tuned. Big eCommerce shifts are ahead, and they will divide strong from the weak. Those who fail to stay afloat will be eaten up by the competitors in a split second. Check up these eCommerce trends 2018 that will guarantee your business to cope with all the challenges and celebrate the real victory. This article will give you a quick look at what is seen on eCommerce skyline! The trends in ecommerce industry will help you to find aspects to base your business strategy on. You have all the opportunities for growth and development. The eCommerce game rules have been changing, and you’ll love them! Throw your pen and paper away. If previously you could cope without automatic audits, statistics and graphs organized in one click and eCommerce reports on the required periods, nowadays it is impossible. Once the solution your online store is based on does not enable you to have advanced eCommerce reports functionality, your business will suffer a lot. Manual inventory management is the thing to leave behind. The variety of powerful eCommerce solutions, Magento or WooCommerce for example, will help you organize the business, keep the clients happy and open up for the development and innovation. Artificial intelligence is reported to increase in revenue bringing $36.8 billion by 2025. eCommerce brands get a fair share of this pie and ChatBots are becoming mainstream. ChatBots has become more intelligent, predictive and, thus, more efficient offering vast opportunities. Chatbots are now considered an optimal solution to improve customer service and customer experience across industries. “Chatbot interaction is predicted to increase from 20% in 2017 to 93% in 2022”. Humans are restricted at the number of activities we can do simultaneously. Chatbots are not. Having conversation with a thousand of customers is not an issue. Regardless of what time or day or holiday is it, the client will get immediate response. Plus, a chatbot ALWAYS treats your customers in the most polite way. You didn’t expect to see this trend in the list? In the era of full automation making your product unique and exclusive will be significant as never before. The highest-spending and highest potential buyers expect shopping experience that offers something special. They need brands that tell stories and that have peculiar philosophy. It is the moment when small businesses come as real winners. In this aspect, large companies have to borrow business experience from the small ones. You can personalize your online store digging into your audience and get it hooked. Vast customization capabilities are one of the most significant factors to take into account while choosing eCommerce platform. “33% of European respondents in 2016 believed that digital currencies are the future of online spending”. Setting up bitcoin payment method for the online store would be something as usual as having PayPal integration. Currently, you can easily install bitcoin payment option to your WooCommerce, Shopify, and BigCommerce stores. You might be already tired to come across “big data”, “artificial intelligence”, and “machine learning” in every single article on eCommerce predictions for the next year. Please, don’t be - previous years were only the beginning. 2018 will become the year when online store owners will use machine learning to boost their sales and manage their businesses efficiently. The main point? Using digital currencies and machine learning technologies are the key factors that will contribute to highest level of personalization in the sphere of eCommerce during 2018. The customer no longer has to hop to your online shop, hop to the application afterward - all the necessary information will flow to a customer according to his or her preferences and needs. Being wherever your customers are and being adapted to the devices they use is no longer something extraordinary. It is an undoubtful “must”. Being available is not the main thing, you should be able to immediately resolve the problems your shoppers might encounter. The effectiveness of using multiple channels is defined by the fact whether your customers can quickly get what they are looking for. And that’s where you need one integrated system to manage all the channels you are present in - omnichannel ecommerce platform is the solution. In 2018 online merchants will seek highly intelligent omnichannel solutions that will support everything from live chat, social support or chat bots. To make the first step towards omnichannel strategy - base your online store on the platform that already has the necessary functionality to manage all the channels simultaneously. You would need a solution that enables to synchronize inventories easily and manage all the channels you are using to sell online. B2B businesses have earned $7.7 trillion in 2017. Stunning number which becomes even more impressive once you consider the fact that B2C revenue is three times smaller. This is the huge sector of eCommerce will experience the change of philosophy towards the concepts B2C has developed during the last 20 years. What is meant here? B2B ecommerce trends will get reshaped. B2B businesses demand the eCommerce functionality that B2C companies use and will become more buyer-centric working on simplification of ordering process. Following the link you can check the list of Top 6 Best B2B eCommerce Solutions and evaluate the opportunities each platform offers. Once you are in eCommerce for some time, you already know that the first platform you choose to base your store on will not become the one that fully meets your requirements. Once you start your way to online selling this is something you will eventually learn. As your business grows your online store will need more enhanced functionality which the platform you’ve started with, simply, does not offer. The good news - replatforming is no longer an issue. If previously online merchants were not fully aware of the possibility of automated migration and tried manual transfer or hiring developers to write custom scripts. In 2018, such manipulations will simply become the waste of time and resources and will have inevitable circumstances. What online retailers have to do nowadays is to react quickly and not to waste a single minute. Limited functionality of your current shopping cart should not prevent your business from development. Any hesitations? Try to perform Free Demo via Cart2Cart and you’ll see how easy it is. Striving for customers in 2018 shopping carts will offer more advanced eCommerce functionality, more reasonable payment plans and wide range of opportunities. Cart2Cart has already defined the ultimate winners in this competition. 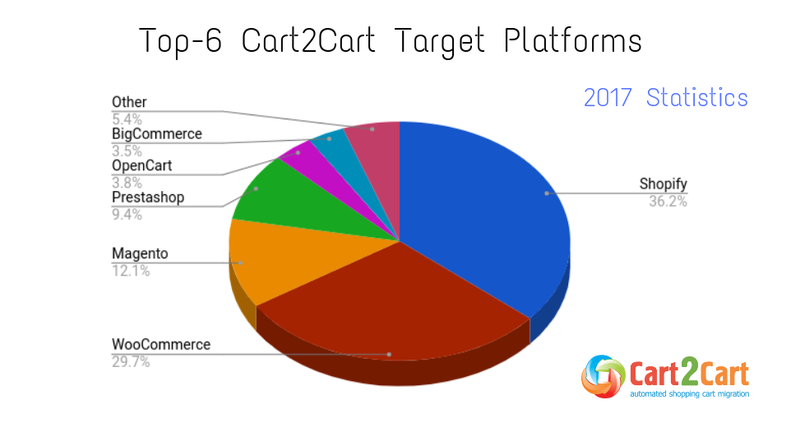 According to 2017 migration statistics the Top-6 Target Platforms online merchants are striving to migrate to are: Shopify, WooCommerce, Magento, Prestashop, Opencart, and BigCommerce. Those are the solution that are developing at a high speed and will ensure success to all types of businesses. Once the eCommerce solution you are interested in is not the list - check migration details for 80+ platforms supported. Visual content is non-negotiable in 2018. VR and AR technologies will change the game substantially. Better to say turn it over and then over again. Imagine your customers being able to visualize your products in their houses or apartments or offices before purchasing. Won’t it be the great opportunity to increase the revenue? “Augmented reality and virtual reality will bring $150 billion profit by 2020”. Clearly, before we learn to run we walk first. Once you are not ready to implement VR and AR technologies right away try to concentrate on simple steps towards improving the quality of visual content you are offering to your audience. Interactive graphics, live videos and apps to make the content more engaging will be good ideas to start with. Pay attention that ideal pictures are no longer effective. Perfectly smiling people are not what people want nowadays. Try to substitute all the picture-perfect images with authentic and live ones. Plus, experts keep claiming that word search will soon be substituted with image search. Visulas has never been so significant. Voice and image-based searches are reported to constitute 50% of all searches until 2020. Even a slight delay in order shipment will lower your brand credibility. More and more companies guarantee the products to be delivered within 24 hours. This is something you should go for in 2018 too. Logistics has never been an issue online merchants are fond of. Nevertheless, in 2018 it will be the defining issue. The best online stores will be able to deliver products quickly by default and this benefit will increase their customers’ loyalty. Those who will mess up with the shipment will be excluded from the desired list. To guarantee your clients this option you need a platform that will simplify this for you and your employees. Shopify is the first eCommerce platform to offer “Same-day delivery” app that is free to install, you will pay for fulfillment and physical orders delivery. The beginning of the year is the time when online retailers carefully plan their business strategies. Each idea is worth considering and each opportunity should be taken. Evolving will be the key to success in 2018 and the true game changer. eCommerce trends 2018 listed above will set the pace during the next year. Online shopping trends statistics and research data mentioned must have persuaded you of that. Newness and creativity are the two key concepts to focus on. Implementing changes is always something we fear of, yet this risky step is unavoidable in 2018. To start with, consider whether your current shopping platform is professional enough and will give you the necessary functionality to grow according to the trends. Once you have even a hint of hesitation check what benefits more enhanced platforms currently offer. Cart2Cart migration service offers you to check these benefits in practice. Perform Free Demo Migration to the shopping cart you are interested in and make the first step towards business success in 2018! Sigh Up for the account in a click! 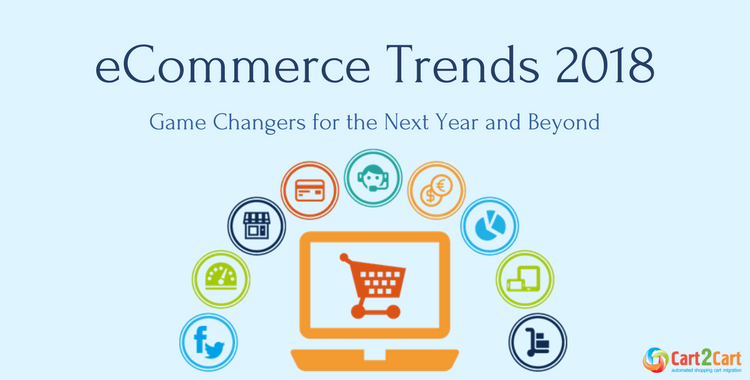 2 thoughts on "eCommerce Trends 2018 - Game Changers for the Next Year and Beyond"
I really enjoyed reading your article, you have provided the most crucial eCommerce trends in 2018. you have discussed some aspects of the latest eCommerce news and you have mentioned the personalizing aspect but I would like to add that, the optimization and the personalization of your check-out page are crucial too. I bet you would like this article https://goo.gl/kVQmk5 there are some special trends in it. Thank you for your commentary and positive feedback. The article you suggest might also be helpful for our blog readers. We are eagerly waiting to hear more from you!